Oasis of Dreams Rehearsals - The Royal Caribbean Fan Blog. When the ocming of Oasis of the Seas was announced to the world, one of the first features highlighted was the Aqua Theater. Situated at the very end of the ship, the seating bowl spills outward from the end of Boardwalk. The Aqua Theater hosts more unique features in one location than most new cruise ships do through their entire design. As the name implies the theater is centered around a large diving pool. Three tiers of diving platforms flank the pool on two sides. A trampoline emerges from the adjacent stage and adds a different dimension to what the show offers. A "fly gallery" allows actors to fly into and out of the area, even emerging from under the water. Under the water are three stage platforms. These rise above the water to allow for the entire stage space to be used or sink quietly for dramatic effect. In our video here, you see the Aqua Theater from a deck ten stateroom balcony over Boardwalk. The cast is rehearsing a few hours before a show. The video screens were being replaced on this cruise so you might notice they are missing from the right side of the theater house. As a people watcher this view was one of the attractions of the cabin. Love Royal Caribbean? Join me at our home at Cruise Aficionados and share reviews or post in our forums! MSC will port the first of the Seaside class at Port Miami when the lead ship comes online in late 2017. 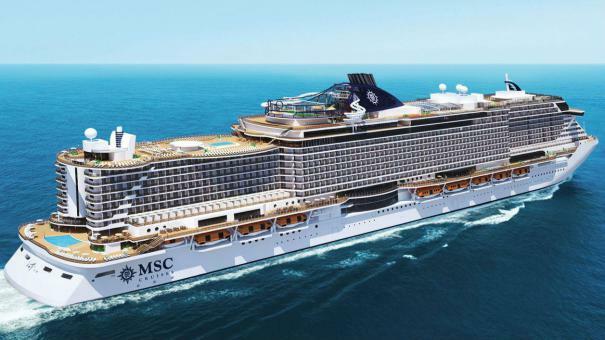 Projected to carry an estimated 4,140 passengers the ship represents the latest and boldest move by MSC to build its presence in the north American cruise market. The design of the Seaside is innovative in ways normally seen only among the Royal Caribbean fleet. The Seaside will live up to her name by introducing a wide and close to the water pool deck aft, along with generous promenade space along the sides of the ship. At a time when ship design is increasingly turning passenger attention away from the ocean the Seaside embraces it in bold fashion. Some bemoan the growing size of cruise ships but like the Voyager, Freedom and Oasis classes, size does bring the means to create environments at sea unlike any before them. Previously MSC has featured the Divina in marketing to north American cruisers. Where the MSC Divina is a highly regarded but very conventional design, the Seaside class will the Seaside will represent a true "signature" ship to define the public's mental image of the line. Her placement at Port Miami also represents a very high profile location at a time when the busiest cruise port in the world is experiencing a surge of new ships and lines as well as the return of lines as Cruise Aficionados reported earlier this week. Hurricane Irma is picking up speed and power. Per our updated image here, thanks to the National Weather Service's National Hurricane Center, Irma is expected to be near or ashore in the Florida Keys and possibly the greater Miami area. Major cruise lines are already canceling cruises ahead of time and sending ships to alternate ports ahead of time. If you are cruising within the next two weeks you should contact your travel agent or cruise line today. The Sum of All Pitches: Travel Give-aways Judged. Not worth the plastic it was printed on. What of the product the company was selling? Was the company legitimate? Is anything they sell worth anything to anybody? Is it a scam? Researching the company and details reveals several things. First, in the strictest legal definition the company and its product are not a scam. It is the very precise way everything is presented and how the contracts are written that keep this company from straying into legal trouble. For some people who can afford to buy and deal with the limitations and complications that seem systemic to this sort of product it can be a favorable arrangement. However for many people these situations can be problematic commitments of money which they are never able to gain the promised travel. The most telling thing to my mind was that the walls of the office are coated in pictures of people when they buy the memberships. Yet there are none of people at any of the travel options the membership provide. Indeed, we were told repeatedly that we could not and would not be able to review a sampling of the travel options. I can find nobody online blogging about their latest travel club trip. And in truth I can find virtually nobody who will openly admit they have such a membership. Likewise, in reading about those who bought and later attempted to get out of their contracts, virtually nobody does. Are there alternatives to these clubs that provide the sort of travel options and value but without the financial strain and obligation? Absolutely. The entire premise of this companies product was that it gathered endless options for travel at prices only possible for the reasons they explain to you. Yet most travel agencies and agents can book through wholesale companies and through industry promotions that give you every means to travel when you want and the way you want too. My own advice? Avoid these booths like the plague. You should not have to pay money just to hear a sales presentation. You should not have to sit through a sales presentation to receive an actual “prize.” No prize should be so rigged as to seem intended to be more hassle than it is worth. You should never have to commit so much money for a membership for products or services you cannot review in detail. Do I have a horse in this race? Certainly, but so do you. These companies have a choice to present things professionally and without pressure or masking the insanity of their self-serving contracts and financial systems. Shop carefully, ask questions. Have you dealt with timeshare pitches? Share with us in the Travelers Dominion forums! Through the Looking Glass, Darkly - the Pressure Begins. Math and not for the faint of heart. It is at this point that these presentation turn a bit dark in my view. Once the basic product the company sells was reviewed a series of options to “get even more value” and options that were cheaper for those more modest budgets were presented. First, the core product amounts to over twelve thousand dollars and requires a four figure up-front fee, monthly costs and annual fee. Limitations to the “travel club” ensure members are locked into the deal for at least ten years. Gallingly the company offered to “finance” the up-front fee, which is amusing since they were not actually lending any money. Yet they then charge interest on the amount of the up-front fee not paid initially. Once the salesperson finally reached the end of his presentation he surveyed the room sizing up people and informed us that due to a limited number of staff working that we could only leave one couple at a time to receive our travel prize. Anybody who actually wanted to buy the product was taken first and quickly ushered out. Only one couple elected to do so. The salesperson slowly selected each couple to leave seemingly based on the level of resistance shown during the presentation. We were taken last. We were taken to a second salesperson who sought to convince us to buy one of the memberships in a big open room with the other couples seeing to their business near us. 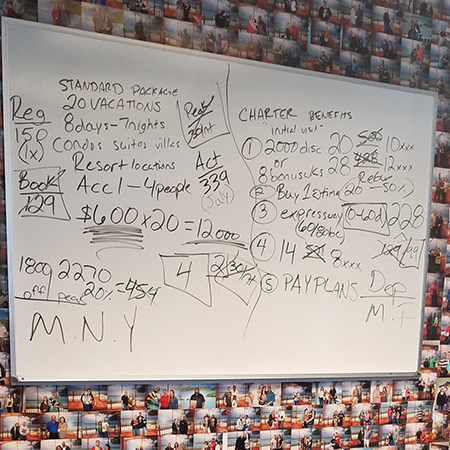 This will lasted no less than ten minutes and the presentation given was geared to determine how much we could afford to pay for the up-front fee and to agree to their so-called financing. I told the young salesperson directly we were simply not going to buy and didn’t wish to waste his time. He quietly said he had to go through the entire process of drawing charts and numbers for us or he would get in trouble with his boss. We allowed the young man to finish he said he would get his boss to see to our prize. Next we were given the third attempt to close a sale by another salesperson in a suit who took us to another office and privately tried to get us to give him a up-front fee we would agree too. I made an attempt to see how low I could push the salesperson without giving him a number, or if he’d eventually cave-in and waive the fee. But once it was clear we won’t buying the sales pitch he left to get a check written for the appointment fee. 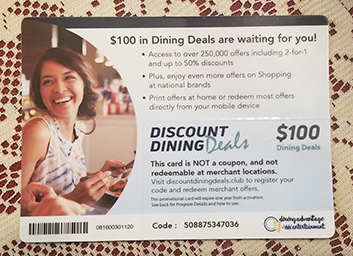 We were given a pre-printed card with a website and code to redeem the cruise we “won.” Since this company wasn’t really a travel agency they had nothing to do with the prize except to promise it to us. We were given certificates for gift cards as well. But like every aspect of the process, the cruise and certificates were calculated to be virtually worthless. To actually get the cruise we had won, we would have needed to pay hundreds up-front to a fourth party which has an entirely negative reputation based on research I did afterward. The same was true of the gift card certificates. It is so difficult or expensive to obtain the cruise or gift cards it isn’t worth pursuing. With the cruise specifically the best one can do while paying the bare minimum is more costly than deals you can obtain from actual travel agents and agencies. Tomorrow, we wrap-up the journey down the rabbit hole reviewing the actual "prizes" and what happens after the presentations. We also share my feelings on these companies and alternatives to them. Have you survived one of these epic adventures? Share with us in our message boards! Sin City Freezes Over: Snow on the Strip! The infernal regions did not freeze over but snow did accumulate on the Las Vegas strip! One Instagram users video looking out from the Cosmopolitan. Believe it or not, this actually happens albeit rarely. There have only been a dozen or so incidents of snow accumulating in Las Vegas proper during the past fifty years, the most being three inches in 2008. Travel Prizes: An Unlikely Give-away. Airbus to end A380 production with final delivery to Emirates in 2021. Man Dies at LINQ High Roller Farris Wheel. Norwegian Epic Crashes Into Pier. Follow us with your favorite social media!